As all drivers know and non-drivers may not know, the Federal DOT requires that every commercial driver stop for no less then 10 hours after driving for 11 hours within a 14 hour period. Then on top of that you can not work for more then 70 hours within a 7 day period. That is not what this article is about. The point of telling you all that mind numbing information is that for a least 10 hours a day and possibly 34 hours each week (to reset the 70 hours), we have to park the truck. Now most park at the nearest Truck Stop, which may or may not have amenities such as a TV, Showers and so on. So what are we to do? What else, watch TV. Now that brings up some more problems. Most of us carry TVs with us, but what happens if you are not near a major town when you have to park? Ever try watching PBS for 34 Hours? I have, not fun. What I liked to do is watch a movie or 10, and catch up on the latest episodes of my favorite TV show. Buying movies at the truck stop can get kinda expensive after a while, and if there is not a Wal-Mart within walking distance you are kinda out of luck. Until now. The Internet has taken over the world (at least at home), and it is now available for us drivers. Most Cell Phone companies are now offering some type of streaming package, making it easy to watch your favorite movies and TV Show. So how do we do that in our truck with our own TV? 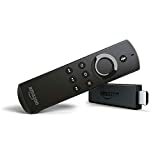 Check out the Amazon Fire TV Stick. The Fire Stick attaches to any WiFi hotspot, so you can use a Mobile WiFi Device or the truck stop WiFi. Now you have access to such services as Amazon Prime, NetFlix, Hulu and the list goes on. I had this setup in my truck for years. I used a Mobile WiFi device and my Cell Phone Company offered a streaming service so that anything I streamed did not count towards my monthly Data Cap. I was able to park for the night and watch a movie on NetFlix or the latest episode of my favorite tv show on Hulu. So how does it work? It will connect directly to an HDMI Port on your TV. Power up the TV and the Fire Stick will turn on with the TV. Once it is booted up, it will ask you what WiFi Network to connect to. Point it to the WiFi System you want to use and you are off and running. Is all the streaming free? No, You have to pay for NetFlix and Hulu. You will have to pay for Amazon Prime as will but that is a yearly payment and there are more benefits then just video streaming, you get free 2 day shipping, access to Kindle Books for Free and the list goes on. Okay that is all fine and dandy, but what happens if I just want to watch live TV and I can not get over the air stations? Well I am glad you ask, I have a solution for that as well. The 3 top streaming services for live TV is Sling, Playstation Vue and DirectTV Now. All 3 services offer a trial period and have different packages you can choose from. So for $20.00 to $35.00 a month you can get all the cable networks stations you could watch including HGTV, CNN, DIY, CMT, ESPN, MSNBC and the list goes on. In some locations you can even get NBC, ABC, FOX and CW. So in short, you no longer have to hang out in a truck stop watch TNN on the 30 year old TV they have in the Drivers Lounge. Now you can watch the best TV, just as you do at home, in the comfort of your truck. I don’t know about you but for me, I would rather hang out watching TV in my truck then to listen to the Supper Trucker tell the same old story over and over. I have compiled a list of site to check out and a link to the Amazon Fire TV Stick I sell on this site.